We Are Not Hypochondriacs . . . But Maybe We Should Be? | Troy C. Wagstaff aka CallahanWriter Blog: Topics of interest include Western Historical (1865-1899) Topics. Additionally inspirational Christian and Fibromyalgia interests. We Are Not Hypochondriacs . . . But Maybe We Should Be? There’s always something to say about Fibromyalgia which speaks to the complexity of the disease. There’s always some new information coming out, not always helpful but sometimes that information is a gold mine. There is a lot to talk about when discussing fibromyalgia from fibromite to another. That is where this article comes into play, discussing fibromyalgia from a fibromite who has more than thirty years of the disease under his belt to another fibromite. This article is about “Fibrochondria.” What is Fibrochondria? It is a play on words obviously. It comes from fibromyalgia and hypochondria combined. To those with fibromyalgia, that may sound disturbing, but bare with me. Fibrochondria is the need for a diagnosed fibro patient to not confuse new or different symptoms with those symptoms that are known to come with fibromyalgia. Consider this scenario: You have had fibromyalgia for seven years and by now are well versed in the symptoms you have. Of course you have the chronic wide spread pain and the fatigue but you’ve never noticed in seven years any symptoms related to memory loss or cognitive issues. Then you start to notice you are becoming forgetful. You walk into a room and forget what your looking for. Everyone does that, but in your case it’s happening way to often. All of the sudden you start forgetting words you know that you should know. You can describe the meaning of the word but can’t think of the word. This can come up in a mid sentence. You are forgetting names way too frequently. Other types of memory and cognition problems blur your mind. You take a look at the symptom list of Fibromylagia and see fibro fog. You look into it a little more and decided that these symptoms are just another part of fibromyalgia. At least, now you know why you are having these troubles. We know that there is no know cure for fibro so you take a deep breath and forge on. At least now you know why you’re having memory troubles . . . or do you? This is a big mistake to assume that the symptoms you are having automatically fall under fibromyalgia. It is very possible that what you have is fibro fog but it could also be a number of other issues with your brain. Don’t assume that a symptom you are having is part of fibromyalgia just because it is on the symptom list. Few fibro patients have every single symptom on the list. It is entirely possible to have just wide spread chronic pain and nothing else. Therefore, you should talk to your doctor first before jumping to conclusions. We need to be hypochondriacs over every new symptom until we know if it is yet another fibro issue or something else. What I mean by that is that we need to keep on top of our health because we are chronically ill. If we can treat the new symptom then that is one less thing to worry about. So, if a new symptom presents itself, go get it checked out. If the symptom is something else, it could get worse. I can relate to this. I have had bouts of lightheadedness and extreme fatigue many times over the past years but recently I was going through those symptoms again only it didn’t make sense. My CPAP was properly adjusted, by lungs and heart were both great. I had over come secondary pulmonary hypertension. My heart was healthy and by blood pressure was excellent. I was so fatigued I just needed to sleep. I wasn’t ‘fatigued tired’ but rather ‘fatigued sleepy’ in the extreme. I couldn’t shake the dizziness and lightheadedness and I played with some nausea. A time or two I thought I would faint so I quickly sat down and breathed slow and deep. I went to the doctor to discover my heart rate was down to 45. The doctor put me through four various tests on my heart and lungs. Two tests were over night tests. I ended up with the Cardiologist telling me my heart is healthy and “looked great.” Since he didn’t want to rush into a pacemaker he instructed me to monitor my heart rate and blood pressure for six months and then go see him. They verified in two of the test that I was running a very low heart rate which, with one test got down to 36. My blood pressure continued to be excellent. All of the other tests “looked great” with one exception which was my cholesterol. It was a little high and since it was caught early I could easily manage it without meds. 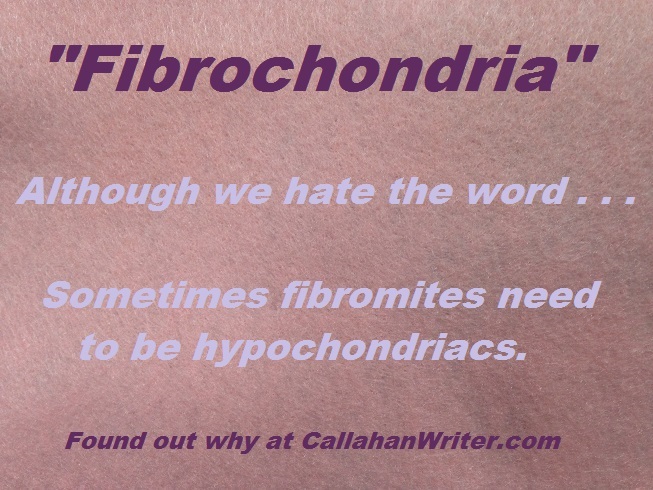 As fibro patients we are sick of the term hypochondria because many health care providers have called us that or at least insinuated that we are making up symptoms and sometimes some fibromites have been accused as attention seekers from doctors. To bring up the term hypochondria is treading on water, but it is something we have to consider. Not all symptoms that match fibro symptoms are fibro related. A single symptom could apply to hundreds of illnesses which is why we must be ever vigilant in determining if new health problems belong under the fibro umbrella or are their own illness or a symtpm of something else. We need to be fibrochondriacs. Using the word “fibrochondria” is just to introduce a little levity in a despairing illness. This article is just my own opinion and in no way medical advise. Before doing anything that could affect your fibromyalgia or any other health issues always consult with your health care provider.